Four female students studying a games course at one UK University took part in a qualitative study of face-to-face semi-structured interviews. 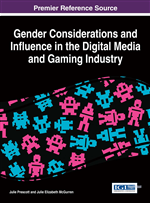 Although a small sample, the study provided an interesting insight into the experiences of the females on the course as well as their views of entering (or at least potentially entering) the male dominated computer games industry. The findings related by the chapter reveal that females choose to study games because they enjoyed playing games. Despite all participants experiencing the course positively, there was some apprehension about going into the industry. Interestingly, the study suggests the male dominated working environment may be off-putting to women, even to women studying and interested in going into that area of work. The main themes that emerged in regard to the negativity associated with the industry were the long hours culture and potential sexism within the industry. The games industry is a male dominated environment, the few females that are employed in this workplace are typically working in non-developmental roles such as administration rather than a role which needs technical ability and a higher level of skill such as developmental roles e.g. programming, design or production (MCV, 2008; Gourdin, 2005; Dyer-Witheford & Sharman, 2005; Haines, 2004). Gender occupational segregation suggests that due to gendered stereotypes there are male and female jobs/roles and as such males and females traditionally prefer to work in what are considered gender congruent roles. Prescott and Bogg (2012) (amongst others) suggest that gender occupational segregation exists across the information and communication technology (ICT) sector and across the wider STEM (Science, Technology, Engineering and Technology) sector. They also state that this issue is not geographically exclusive; these sectors were found to have gender occupational segregation across the UK, Europe and USA. This gendered occupational segregation has also been found to exist within the computer games industry with women concentrated in non-developmental roles as opposed to developmental roles (Prescott & Bogg, 2011).